On June 2, 1953, Her Majesty Queen Elizabeth II was officially corononated after ascending to the throne in February of the previous year upon the death of her father, King George VI. Now the longest serving monarch, surpassing Queen Victoria’s 63 years in 2015, Queen Elizabeth II has been witness to numerous important historic events ranging all aspects of society: the world's first jet airline passenger service, the unravelling of the mysteries of DNA, the release of the first Beatles LP, the first female British Prime Minister, and the Fall of the Berlin Wall — just to name a few. There exists a long standing tradition in the Royal Family to maintain an impressively complete stamp collection that helps to illustrate these important changes as well as the many others that have occurred since the introduction of postage stamps in 1840. Want to start your own stamp collection? 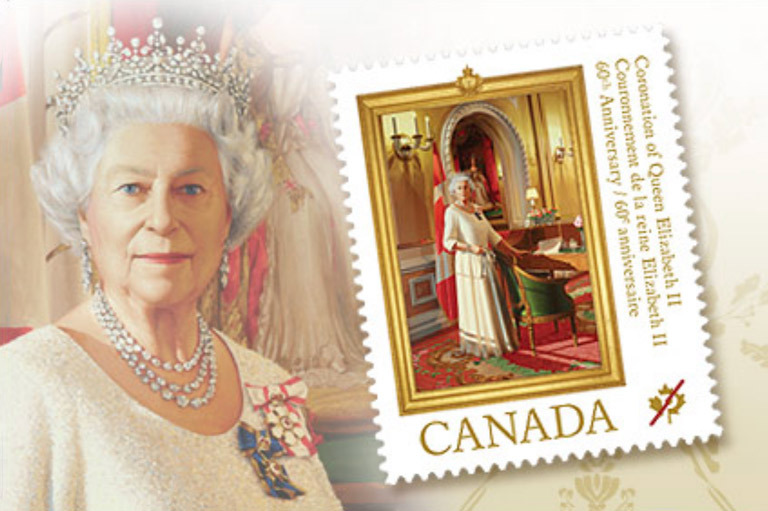 Start with Canada Post’s stamps celebrating the 60th Anniversary of Her Majesty’s Coronation. Get an inside look at putting together the artwork for Canada’s History magazine. Collaboration by historians and artists reveals diverse histories.